— a twisted cord attached directly to the unfinished edge (Ostergard has commented that this cord is "possibly attached with the stitches that form the singling." However, so little of the preserved cord remains on the original garment that she could not be certain. From photographs in WitE, it appears as though the buttonholes on the original sleeve are just a few mm from the edge, and the slits themselves are noted to be 7-10 mm in length. Ostergard also wrote that the original reinforcing singling stitches only extend about 8 mm in from the edge. That means that they only reinforce the half of the buttonholes next to the edge. After cutting out my pattern pieces, the first sewing will be the centre gussets. 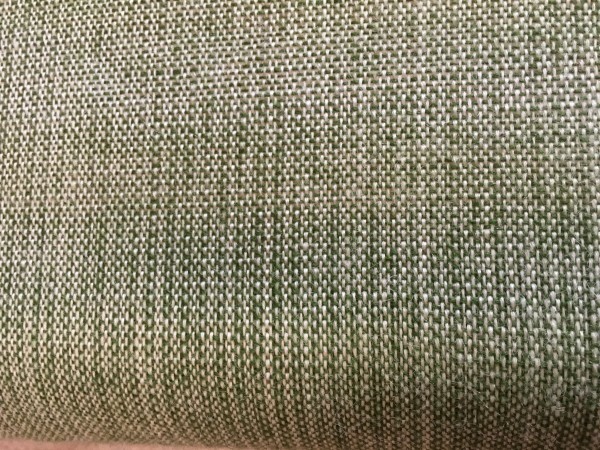 I finished my plain weave green and white cloth! After gentling washing it measures 41.5 cm wide and 8.8 m in length. 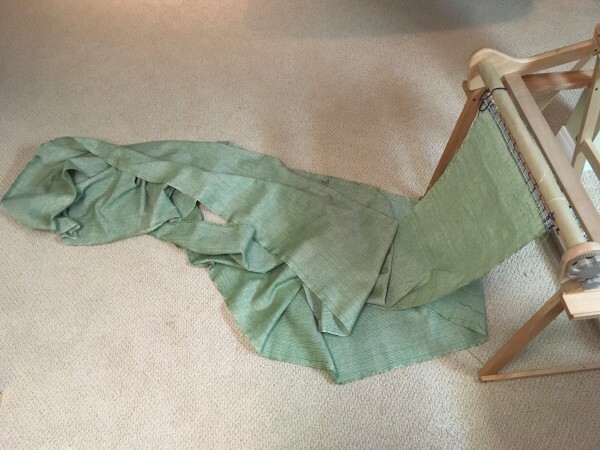 Here's what almost 9 m of cloth looks like like on the rigid heddle loom, on the floor, and washed, pressed and folded! The weave of the cloth is 1/1 plain weave and here are photos of the loom state cloth, and after washing on the "hand wash" cycle with a gentle detergent for woollen textiles. 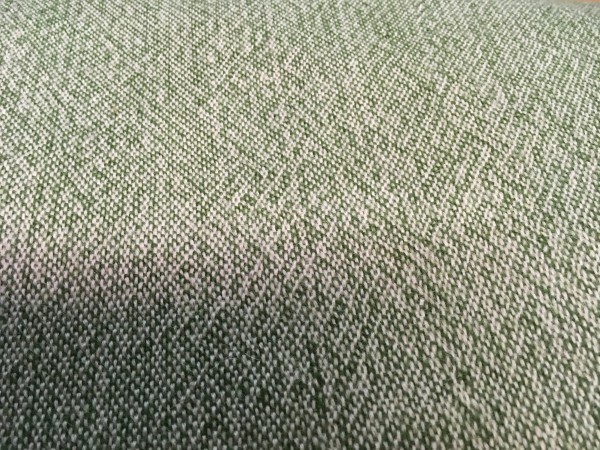 The weave of the cloth has a subtle random pattern, that looks a bit like diamond twill in some places. I talked to a textile conservator about this and she thinks that it may have to do with different twists in the warp and weft, different tensions in individual warp threads, or just because of the differences between the warp (which was 3-ply and strong with very little stretch) and weft (single play, high twist). Whatever the reason, I really like it. This fabric is going to be a second 12-month Herjolfsnes gown. 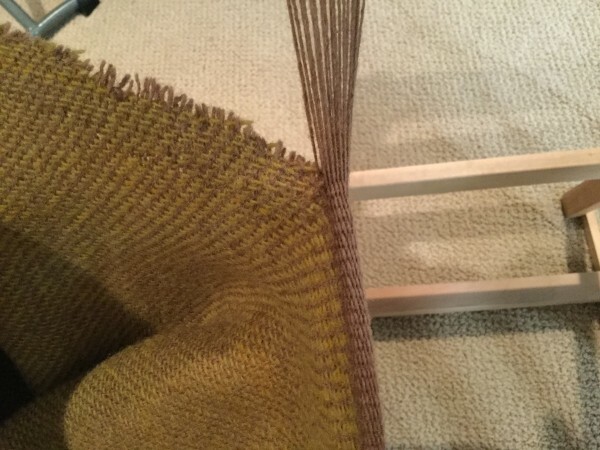 It has taken about 7.5 months just to weave the fine cloth on my rigid heddle loom (about 100 hours of weaving). Now I will try to have it sewn and finished for the fall. My plan is to make a modified Herjolfsnes 41 gown. The biggest modification is the number of side panels. The Herjolfsnes 41 gown has 4 panels on each side and the overall hem circumference is over 4 m!! Given the limited (and slowly produced) yardage of my own cloth, I will only be able to have 2 side panels on each side. The pattern for Herjolfsnes 41 is not presented in Medieval Garments Reconstructed (Fransen, et al. ), so I have decided to use similar shaping of the front and back panels as we see for Herjolfsnes 42. 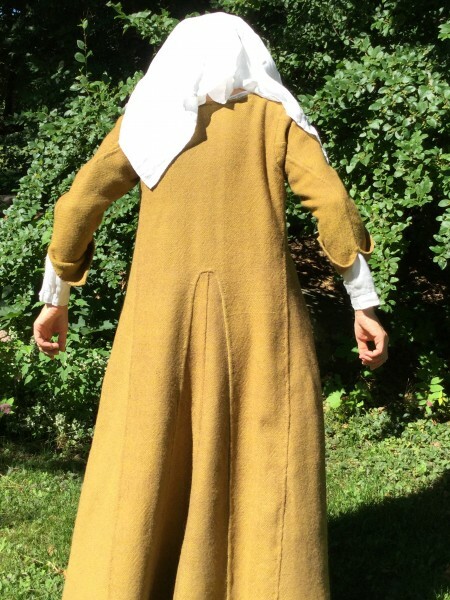 In that gown, there is no shaping for the arm scyes in those panels, they run in relatively straight lines from the floor to the top of the shoulder, and all arm stye shaping takes place with the curved tops of the side panels. I am very excited to attempt, for the first time, the highly engineered centre gusset shaping and insertion. 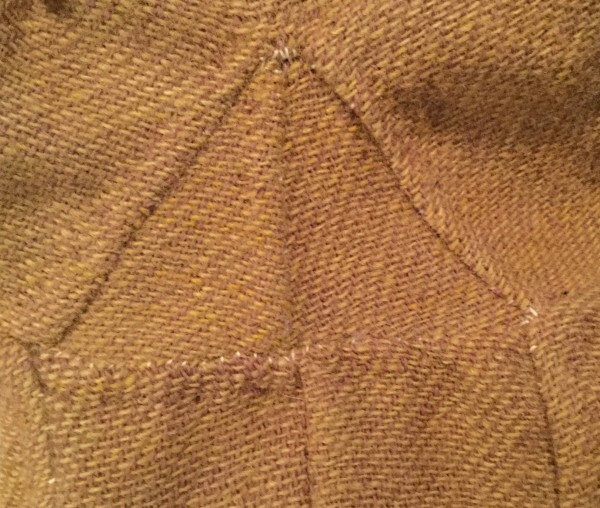 Rather than a single point (which is a stress point on a garment, often producing tears and holes), the gusset is shaped with round double points on either side, with a "tongue" extending down through the middle of the points. Herjolfsnes 41 has these beautiful, and intimidating gussets. Another reason why I have chosen Herjolfsnes 41, is the long, buttoned sleeves. The sleeves each have a 27 cm slit from the wrist, with 16 buttons, spaced 1.5 cm apart. I think that this will look marvellous for a dress I intend to wear as an under gown beneath my yellow Herjolfsnes 42. I am looking forward to sharing this journey! One of my favourite textile reads of the past year has been the thesis, Textile Finds from Medieval Cesspits in Tartu: Technology, Trade and Consumption, by Riina Rammo (Rammo, 2015). Dr. Rammo discusses thousands of fragments of medieval cloth (14th and 15th centuries) from the town of Tartu, Estonia. She described the types of yarns used in textile construction (i.e., coarseness, mixed fibres, dyes, twist, diameter, etc.) and also the weave of the fragments. The vast majority of textiles (>99%) were made from 100% wool. Dr. Rammo found that 58% of the textile fragments were plain 1/1 weave, and 32% were 2/1 twill weave. 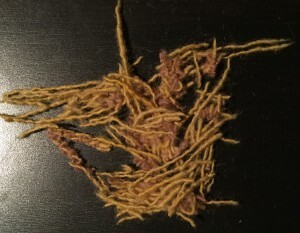 Less than 10% of the fragments were 2/2 twill. 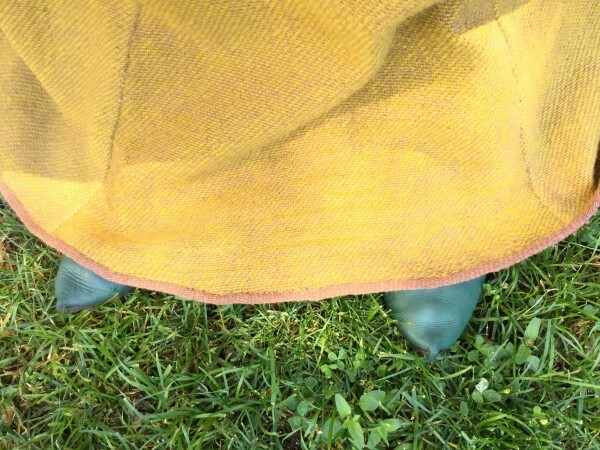 Then, in October I attended Dyes in History and Archaeology 35, where I gave a talk on a new method of natural dye analysis and heard many excellent presentations. 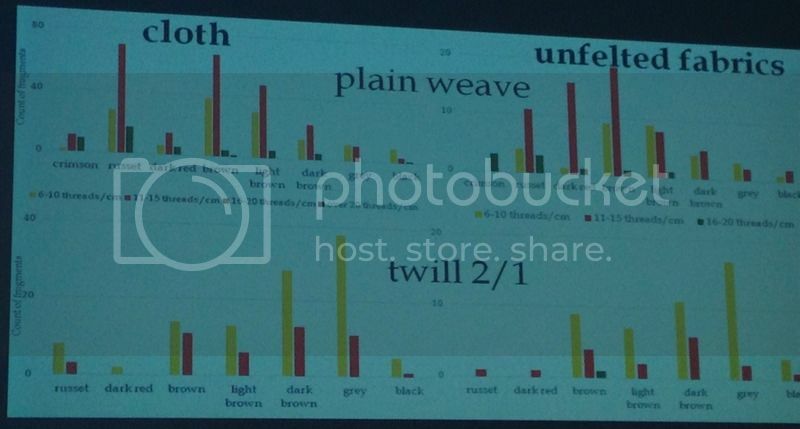 One interesting talk presented by David Kohout, was applicable to the topic of medieval woven cloth, entitled, "Textiles from Medieval Waste Layers in New Town Prague - Identification of Organic Dyes" (Kohout et al., 2016). 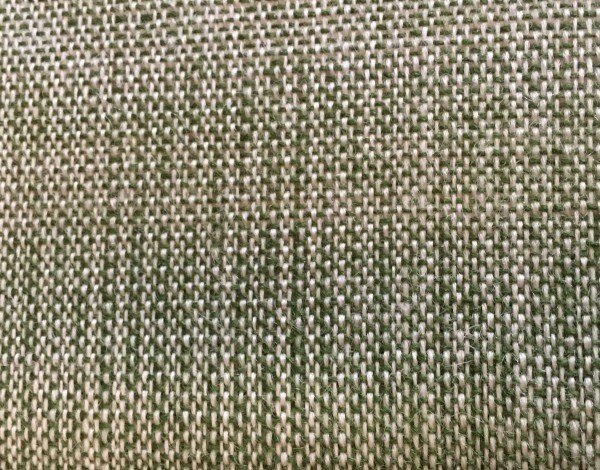 The research team found that the majority of the textile fragments that were uncovered in New Town, from a time contemporaneous to the Tartu finds, were plain weave and 2/1 twill fabrics (see photograph below). 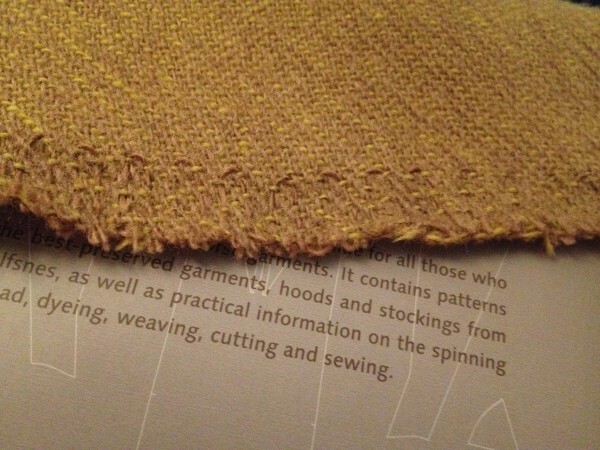 It's tremendously interesting and although the weave of cloth during this period has quite a bit to do with the production of felted, fulled, teasled and shorn wool broadcloth, as you can see from from Kohout's slide, not all the fabrics that they found were felted - in fact, far from it. In New Town, only approximately twice as much fabric was felted as was determined to be unfelted. Slide from presentation by Kohout et al. at DHA35. Threads per cm and colours for the most common types of weaves found at New Town, Prague: plain and 2/1 twill. As an owner and operator of a small rigid heddle loom, I couldn't be more pleased. You can prepare metres of plain and 2/1 weave using a simple loom! And so, I have been labouring slowly away for months on a new project: enough plain weave cloth to construct a closer fitting gown to wear under my loose Herjolfsnes 42 gown (2/1 twill). I am using finer wool than my previous Herjolfsnes project. The warp yarn is approximately 800 m/100g (while the Herjolfsnes 42 dress yarns were 380 m/100g), it's 3-ply natural white wool with very little stretch. 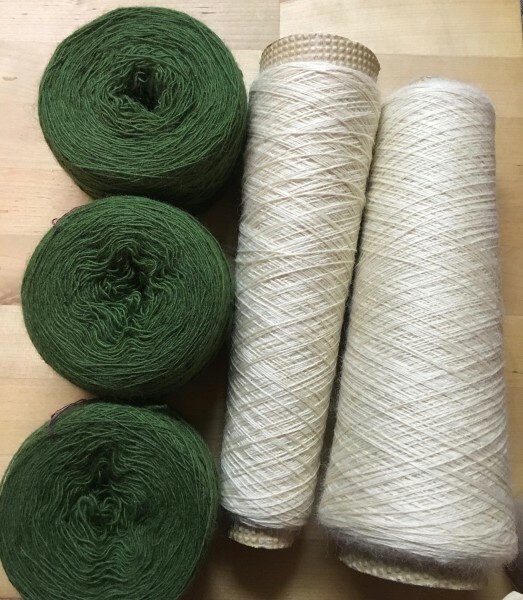 The green weft wool is only slightly thicker and loftier, and a single ply, with less twist and less strength. In the plain weave set up, using two heddles at 8 threads per cm, I can weave about 10 to 15 cm every hour. 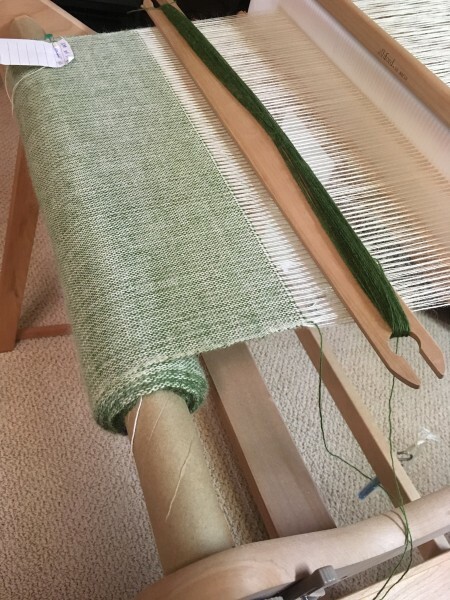 I've warped up 9.3 m on my little loom at 43 cm in width and will be able to get about 9 m of cloth from it, and after gently washing I should have about 8.5 m x 40 cm. This means about 60 to 90 hours of weaving. 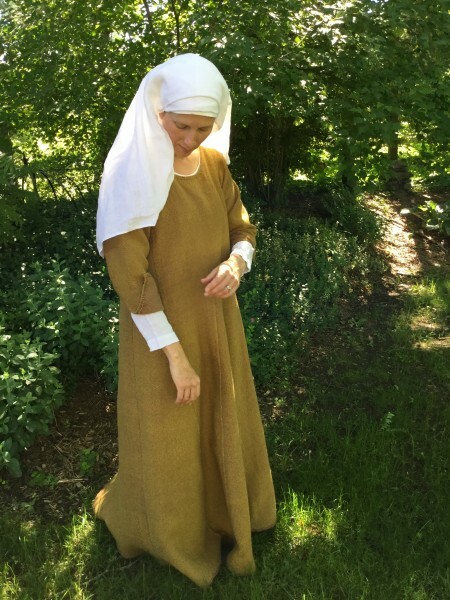 When I find my modern self growing impatient at my rate of textile production I try to focus on the goal of slow medieval fashion. The completed garment isn't the target, the whole process is the target. 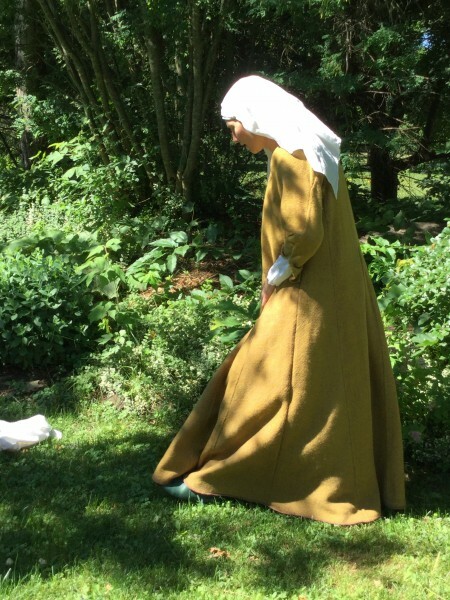 And, taking a year to make a gown is much more in line with medieval household productions and it gives me a more accurate feel for the importance of each line of weft and stitch. I thought that today would be a great time to make a post because I am halfway through! Here's how it looks on the loom. 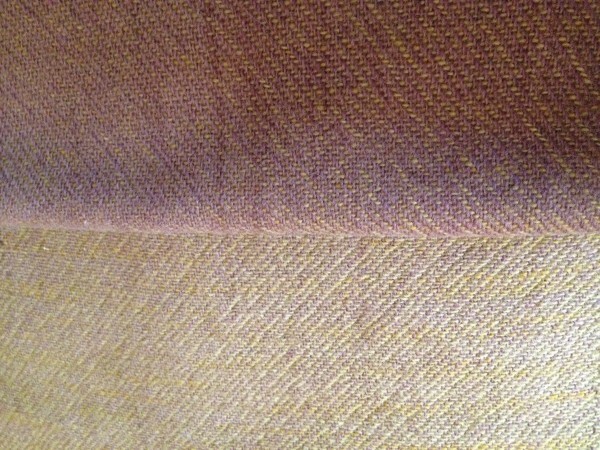 And, a close up of the loom state cloth. I'm really happy with it, and looking forward to washing, cutting and sewing. So, that's it for now and the next little while. When I'm closer to being done I'll have to make a decision on which dress I will make. I prefer constructions with full-length side gores, as we see in the Herjolfsnes garments, so that's the direction in which I am leaning. David Kohout, Helena Brezinova, Josef Chudoba and Ivan Viden , "Textiles from Medieval Waste Layers in New Town Prague - Identification of Organic Dyes," presented at Dyes in History and Archaeology 35, PIsa, Italy, October 5-8, 2016. Riina Rammo, Textile Finds from Medieval Cesspits in Tartu: Technology, Trade and Consumption, (Tartu: Tartu Ulikool Kirjastus, 2015). White Wolf Fian Challenge: Herjolfsnes 42 - complete! This is the fun post - just action shots! I love this gown. 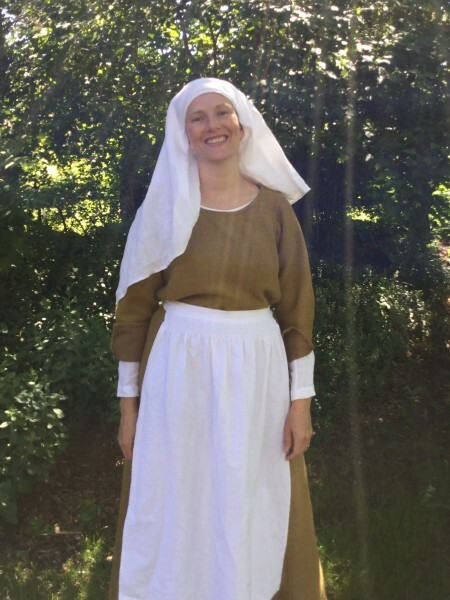 For now it will be the layer I wear over my linen shift, and once I have made another dress that is a bit more fitted, this one will get pocket slits and become an over dress. I feel absolutely beautiful when I am wearing it. Thanks to Elina and all of the Herjolfsnes Challenge supporters for inspiring me to become a weaver and make something this glorious! 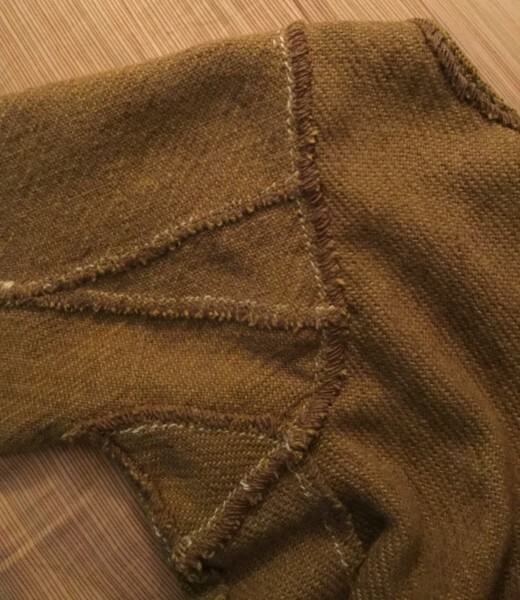 The last step of this project is to complete the lower hem of the garment, which measures approximately 3 m.
The hem of Herjolfsnes 42 was not folded, it was finished with 'singling' and then 'slynging'. 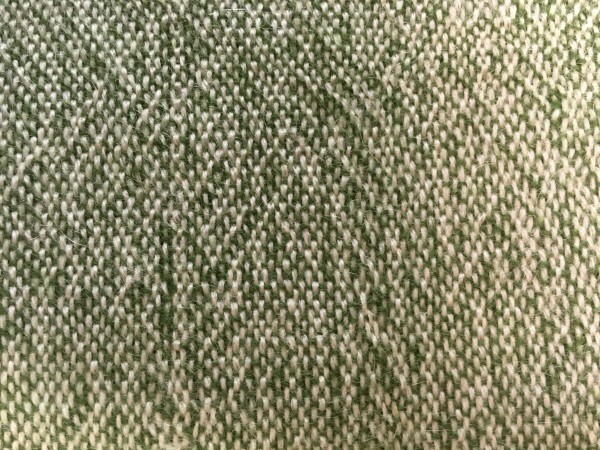 Singling is a serpentine stitching pattern sewn into the topmost threads on the reverse side of the hem, so that is is not visible from the right side. The singling stiches travel about 1-2 cm up into the fabric and then curve back to the edge. There are approximately 5 mm between each arch. Slynging is the attachment of a tabby-woven band along a reinforced edge. This can be done via heddles or using tablets if only two holes are threaded and the tablets are turned forward and then backward to open the same two sheds as you move along the edge (Ostergard, 2009, pp. 97-106). I was very careful with the fitting of my pattern toile and the hem of my gown did not require much trimming before beginning the finishing techniques. I just needed to trim a few weft threads. Because the gore panels of the gown have bottom edges cut on curves, the weft threads do become a bit shaggy, even with careful handling. I could see the reason why reinforcement was required for the original garment. When I was done trimming I had just a small amount of wasted yarn. 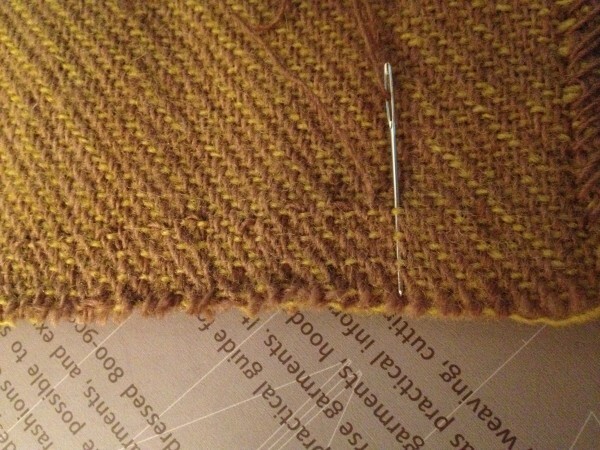 In Woven into the Earth (2009, p. 99) Ostergard mentions the nearly invisible nature of singling stitches. They are more visible when light falls across the fabric (raking) than straight towards. This can been seen in the photographs of my singling stitches, below. In the first picture the singling is difficult to see, but in the second, veiwed at a slight angle, the stitches clearly stand out. You can see by the position of the needle in the first picture, that I left about two warp threads between every singling arch. 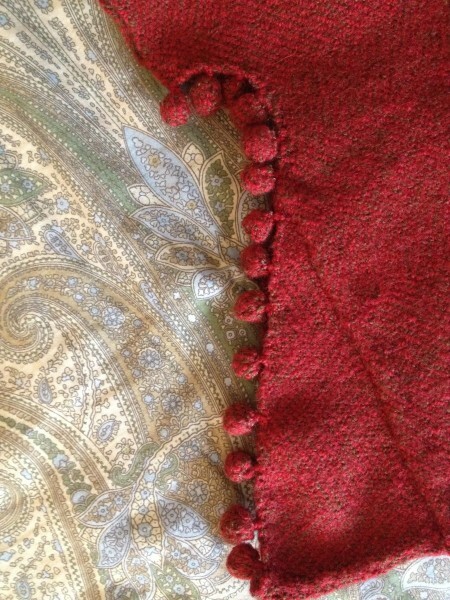 This is a continuation of my 'rule of two' that I used for stitching seams and overcasting. My singling are approximately 17-20 mm tall. These stitches do a remarkable job of adding firmness and strength to this edge. 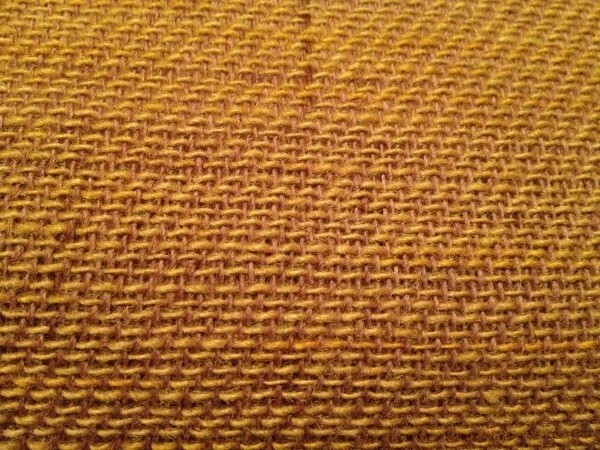 I looped the lower singling arches around the last yellow weft thread to help negate any ravelling. 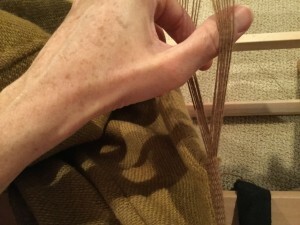 Slynging is a more complicated technique and one that requires a bit of practice to ensure evenness in tension for the warp threads and the weft. Since it is a simple tabby band, I decided to use my rigid heddle. Ostergard reasons that it was likely done using footweaving and string heddles at Herjolfsnes, and this method is still used in modern Iceland (Ostergard, 2009, 105). The warp needs to be attached in such a way that the band isn't so tight that it pulls in the hem, or so loose that causes the hem to ruffle. I tried various tensions for the weft thread and found that loosely pulling the thread to make the band lie flat on the fabric was not optimal. The band wasn't firmly applied, and the edge threads were not caught tightly in the band and looked ragged. Pulling the weft thread so that it lightly cupped the bottom edge was very tidey and it firmly encased the very bottom (and most fragile) edge. In the photographs below I show the slynging from the right side and the reverse side. 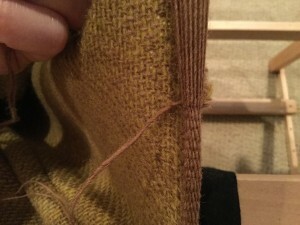 You can see how the little warp and weft threads from the raw hem are neatly caught up in the applied band. The reverse side shows the slynging weft threads as they cross underneath the band. Images of extant slynging on the lower edge of a hood have been provided in Woven into the Earth (2009, p. 218). In that case, the band measures about 7 mm in width (very similar to my band), and it looks rounded, as if it is cupping the the raw edge. The extant slynging looks like the band may be slightly longer than the edging length, causing a slightly ruffled look. Although, with the age and history of the object, that ruffling may have other causes. I'd like to think that it's been applied a bit ruffled, though, because I have more than a few spots on my hem that aren't perfect either! There's no need to beat the weft during slynging. I used my fingers and thumb to pry the shed open and push each weft thread into place. In slynging the weft is on a needle, so you are limited in the length of the weft by comfort in drawing the thread through. You probably should not cut a weft thread that is longer than your arm length when doubled or the first few passes will be a bit awkward. 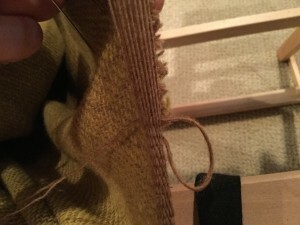 I was very carful when drawing my weft through each time to make a big loop (below), then pull it slowly smaller (next photo, below) to catch the little raw threads, then pull it snug (last photo, below). So, that's the end of my gown - it has been completed!!! My next post will show the finished product. 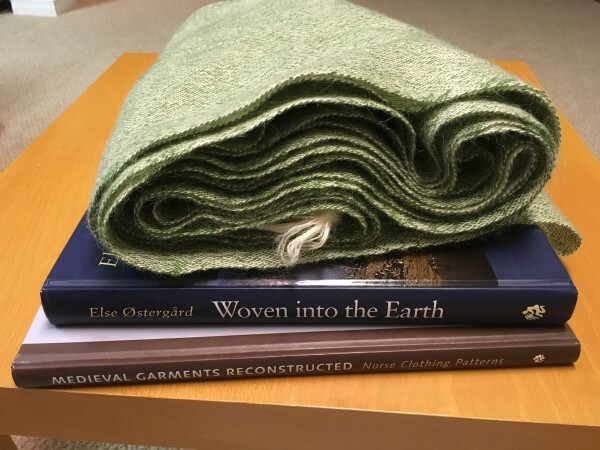 Ostergard, Else, Woven into the Earth: Textiles from Norse Greenland, 2nd Ed., Aarhus Universtiy Press, 2009. The sleeves are one of my favourite things about this dress. The width of the upper arm is just perfect - not too narrow as to be tight when this gown is worn over top of a more fitted dress - and narrow at the wrist, with that very, very useful slit. These sleeves can be turned up in a moment to tackle wet and messy jobs. 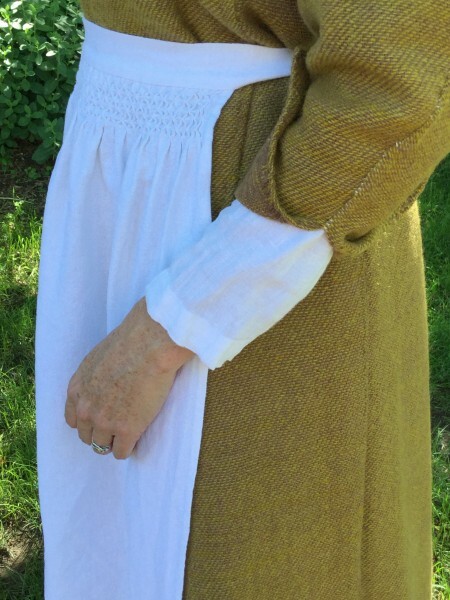 Based on my experience fitting the the muslin toile for this pattern, I was disappointed when I found that the sleeves could not be sewn in without much puckering of the armscye. This may be due to a number of reasons: cutting the fabric slightly larger than the outline of the muslin pattern, sewing narrower seam allowances in the gown than the toile, or the use of a thicker fabric for the gown. 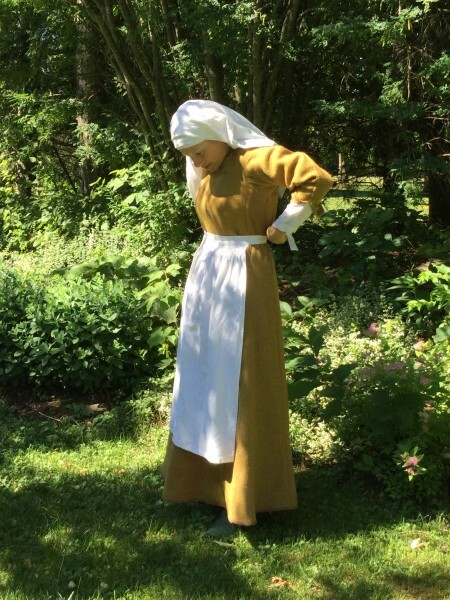 At any rate, I was left with a decision: take in the width of the gown at the side, upright seams to make the armscyes smaller; or add a gusset to the sleeve to make the sleeves wider. 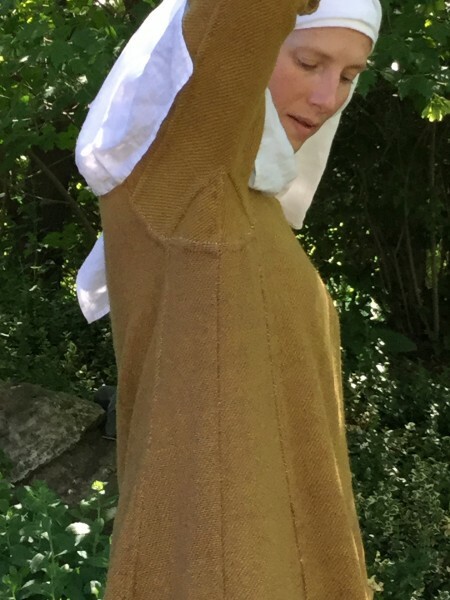 I dove back into Woven into the Earth for help, and it wasn't long before I found a lovely Herjolfsnes solution: garment #45 has two-part gussets at the underarm of each sleeve, described by Ostergard as "a 155 mm long, 120 mm wide two-part gusset...The sleeve is placed such that the bottom gusset seam is opposite the side seam of the garment" (Ostergard, 2009). So, I used some small fragments left over from the woven fabric to cut four pieces that would fit the underarm of the sleeves and be similar to those described by Ostegrgard, above. 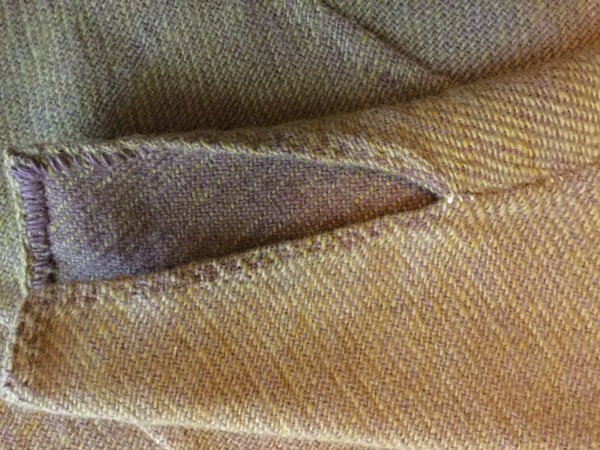 Here is a photograph of the new, two-part underarm gusset, from the reverse side and the right side. The angled sides of the gusset form continuous seams with those from the side-front and side-back gores. Here is the what a sleeve, with new gussets, looks like from the front, and back of the gown (reverse side). I am so happy that I added the gussets! With fabric this thick, I would have been unhappy with tighter armscyes, and I think they would have been uncomfortable. Plus, taking in the sides of the gown would negate my wish to keep this garment with a comfortable amount of positive ease around my torso. My Herjolfsnes 42 gown is coming along very well. I work on it most evenings for at least an hour at a time. But, I'm getting ahead of myself and think I should post some of the photos of the project on its way to becoming a gown. After the cutting there was very little waste. If this was a garment that required buttons my scraps would have been completely used up. As it is, I think that I may make some buttons from the waste, just in case I want to alter it some time down the road and require buttons. I will keep the larger fragments for future mending. 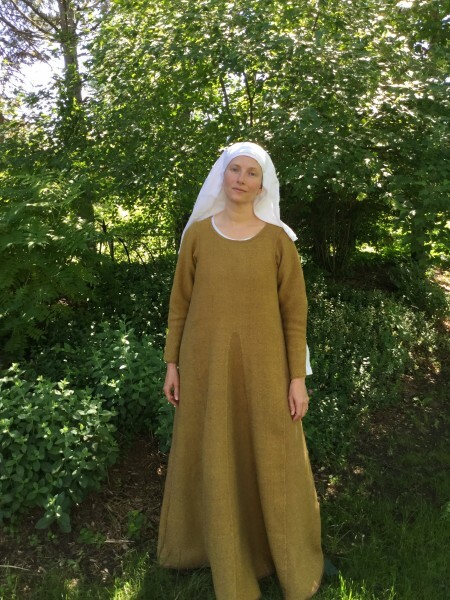 If you are familiar with the Herjolfsnes 42 garment, you may notice one change in my pattern pieces. I found that I could cut the front and back waist-height gores out very economically with the front in one piece, and the back in two pieces. 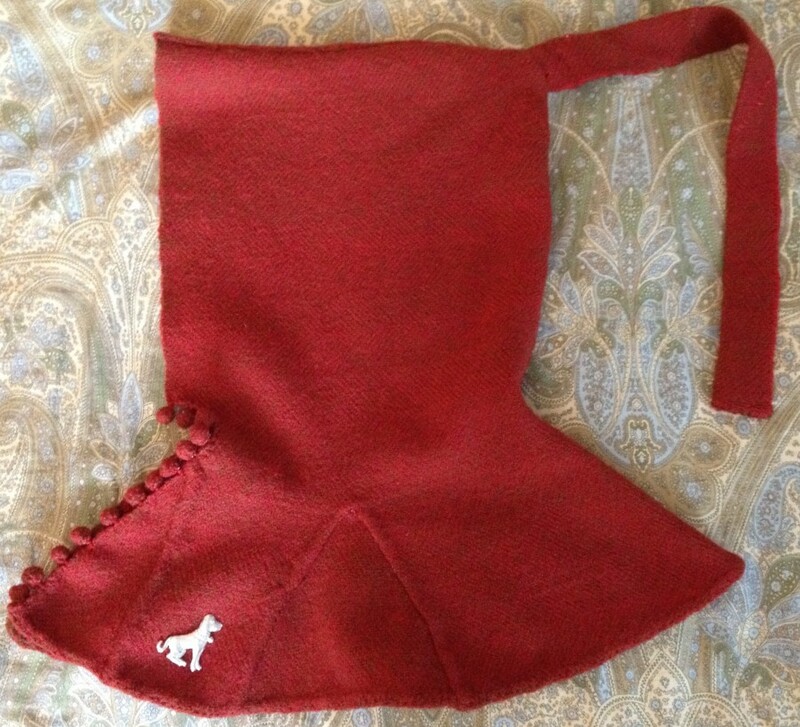 In the original garment, both were cut in two parts. The two longest of these upright seams occur at the exact sides of the garment. 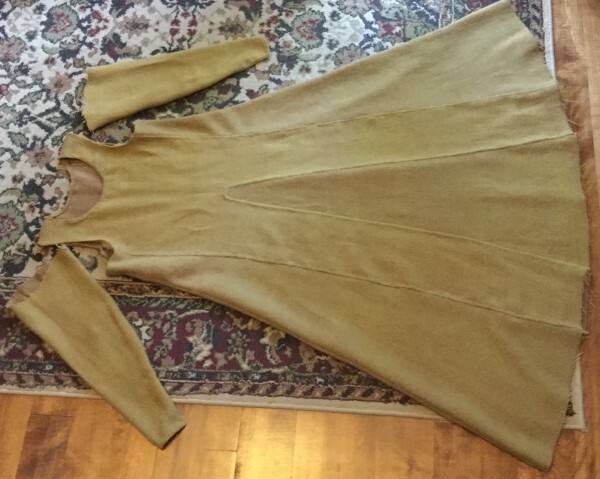 Could this be for ease of adjusting the size of a garment? 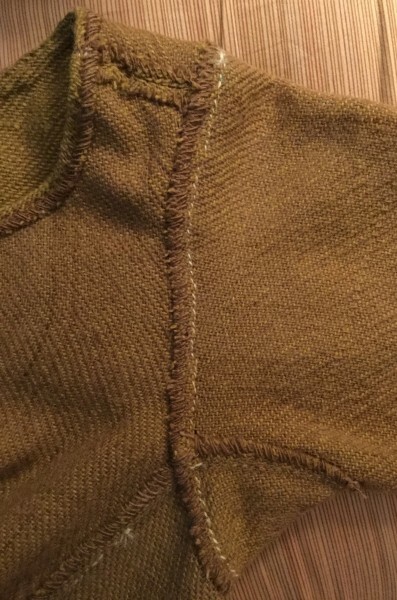 It would be much easier to take in this type of seam, or insert a filler piece. To sew the inlaid seams, I used a line of basting stitches to mark the seam line, while a 1 cm seam allowance of the top layer was pressed down and pinned in place for sewing. 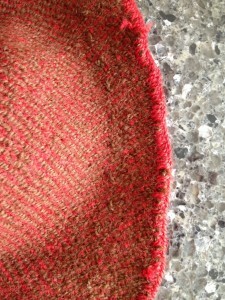 The seam allowances in the original garment were "never greater than seven mm" (Fransen et al., 2011). 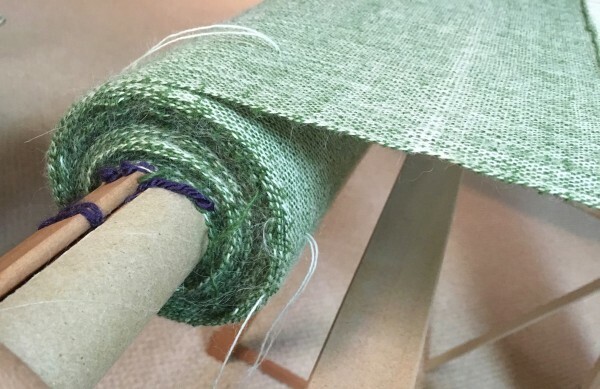 For my fabric, in which the weft threads are not as tightly packed as the original, I decided to add 3 mm to this width because the weave is looser and may come apart if a smaller seam allowance is used. Protect the seams! They are the most vulnerable part of my garment. Here's an image that shows the two types of long seams: inlaid (sewn from the right side) on the left, and the upright seam on the right. 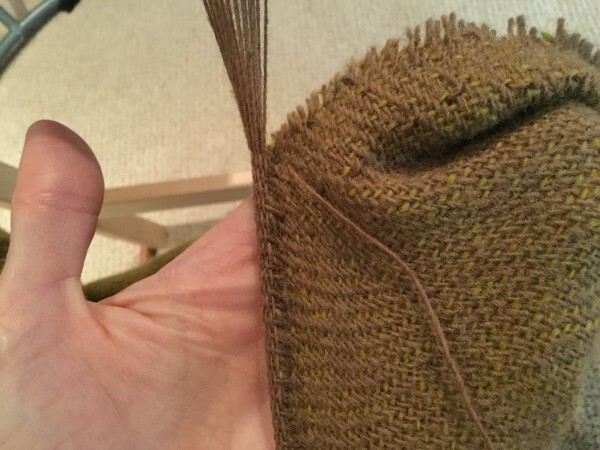 All the seams were sewn using white, plied wool thread, les than 1 mm in diameter; while the overcasting was done using single-ply brown warp wool left over from weaving the fabric. I sewed the seams and did the overcasting using what I have dubbed 'the rule of two'. 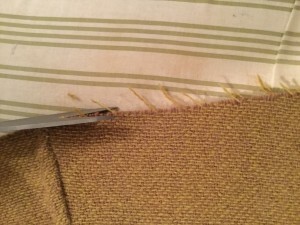 The length of the sewing stitches and the distance between the overcast stitches are just two warp/weft threads each. You can see my little white stitches below. The front and back central gores each have a rounded insertion point. This is an engineering marvel! Instead of on small point on which all the strain and weight of an entire gore has been placed, this pressure point has been increased to spread out the stress and weight. This makes the top of the gore very strong. These gores were intentially cut about 2-3 cm longer than the slit so that they could be fit without worrying about the top edge fraying. Here are some images from the wrong side, showing the insertion of the back centre gore. 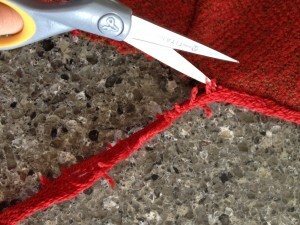 The extra length can be smoothly trimmed away, leaving an intact and strong seam allowance for overcasting. All the long seams have been completed, and the next step is the neckline and sleeves. 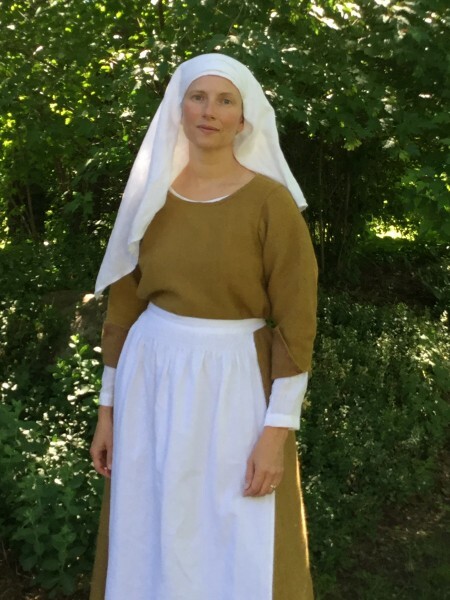 Fransen, L., Norgaard, A., and Ostergard, E., Medieval Garments Reconstructed: Norase Clothing Patterns, Aarhus Universtiy Press, 2011, p. 30. I'm more than half way through waeaving 10.5 m of 2/1 twill for my new Herjolfsnes gown! The first piece was removed from my loom a couple of weeks ago. 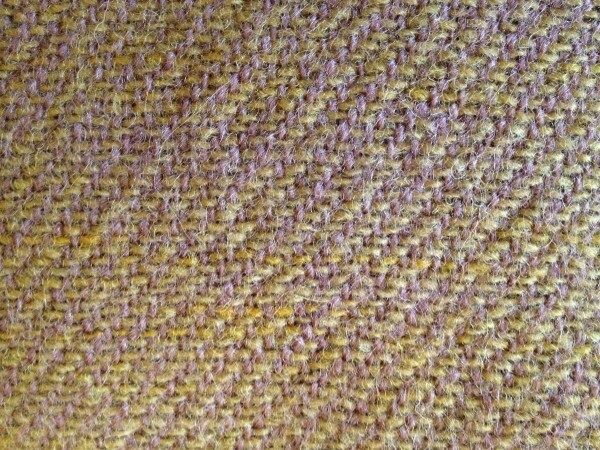 I washed it and the yarns fulled a bit and bloomed very nicely. 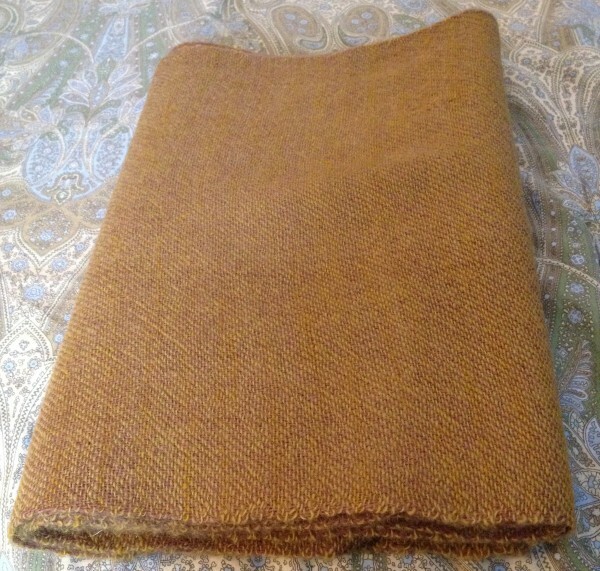 The fabric is cushy, but drapes very nicely because it is twill, and twill drapes like a dream! This is the first of two lengths that I require for the dress. It's about 41 cm wide and 4.5 m long. 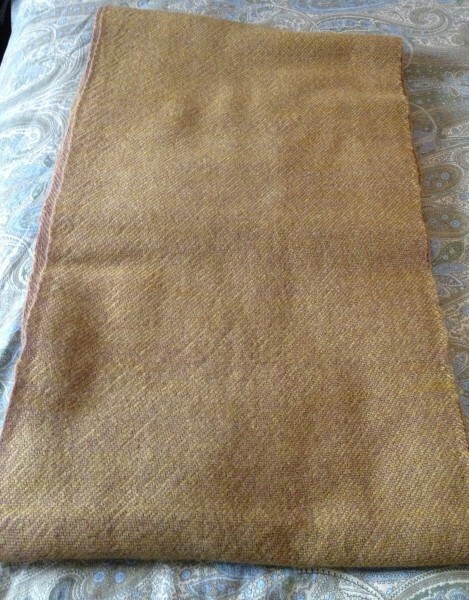 The front side it weft faced and shows more of the mustard yellow, whereas the back is warp faced and shows more brown. The second piece is underway as I write this...with only a couple more metres to go! There's quite a difference in the openness of the weave when the cloth is stretched on the loom versus the state after it has been washed. The threads spring back towards each other, and bloom and full in the wash. This fills in all the little gaps. Do not fear the gaps! I'm now making a muslin pattern for the Herjolfsnes 42 (acc. no. 10584) gown. Last night was the sleeves. I love drafting sleeves! This is a mighty project. It is filled with bliss. I have been working on a small 14th century hood with a buttoned opening. 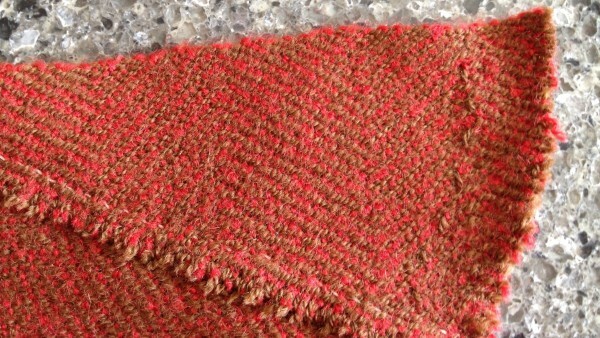 It's made from my handwoven red and brown twill, and based on the Herjolfsnes finds. 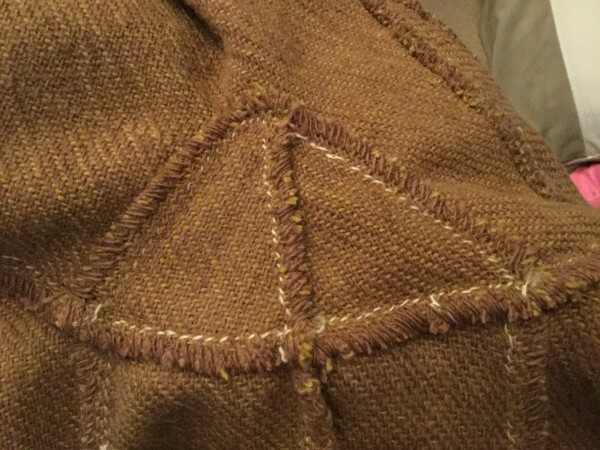 The seams were sewn from the right side with linen thread in small, invisible stitches. 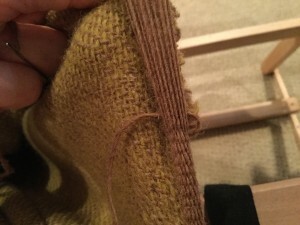 The seam allowances, not more than 7 mm, were overcast with the brown wool that was used for the warp. 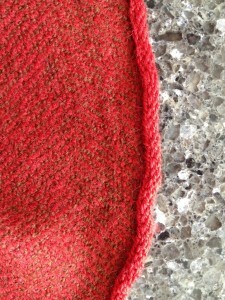 These stitches were made not more that 3 mm from each other and produced a smooth and strong seam finish. 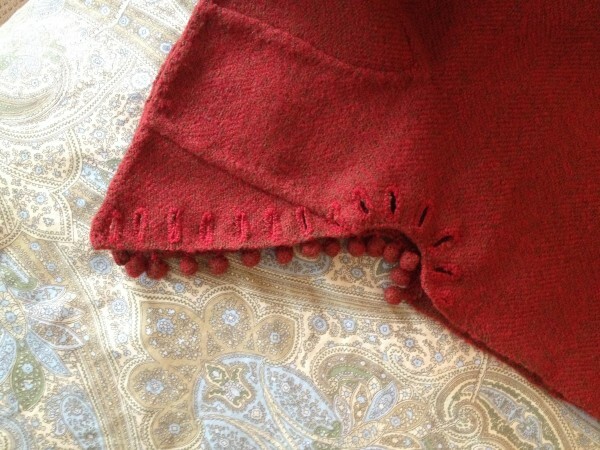 The buttonholes were made with the red wool from the weft. The top edge of the hood rises in a peak at the face opening, just like many of the Herjolfsnes hoods. This enables the edge to be turned back without ugly ripples forming in the hood sides and, probably more importantly, keeps the hood opening from being stretched and stressed. The pattern was cut so that the face opening is a selvage edge. This has also been found in some of the Herjolfsnes hoods. No further seam finishing or hemming was required. 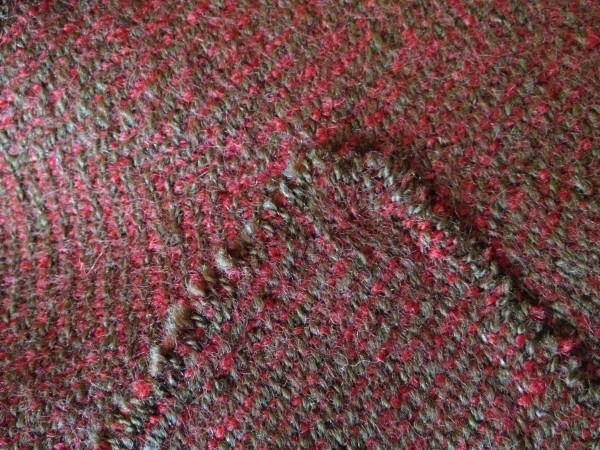 The singling stitches reinforce this edge and will help to keep it strong, and from stretching out. My original plan was to add a woven edging at this singling edge, and I used tablets, threaded in all four holes for the edge tablets and two holes for four middle tablets, but did not like the result: too bulky. So, snip, snip. I removed the whole edge. 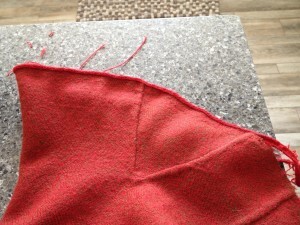 In these picture you can see the bulky edging, from the right side of the hood, and the back side. 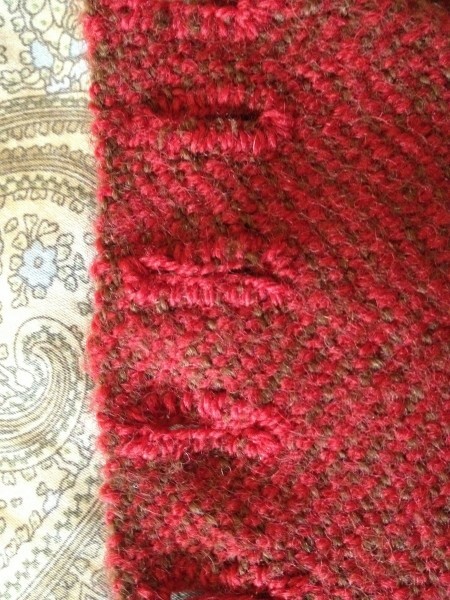 In the brown back side photo, you can see how the edging grabs on tho the singling stitches. But, in the end it was too stiff, and not pleasant. This is one of the best parts of making things by hand. Learning what works, and what does not. Trying new things, and not being afraid to rip out 10 hours of work. The experience of producing this hood is every bit as important as the final object. Because the hood used almost all of my fabric, the liripipe required some piecing. I love this part of the hood! Use all the scraps, make it work, no waste! Can you see the piecing? Here are some details showing the gore insertion, buttons and button holes. I love my new hood!